The fourth anniversary of the explosions in London on July 7th 2005 was marked by the announcement in the media of an inquiry into those events by the House of Commons Home Affairs Committee. The most far-ranging parliamentary inquiry into the 7 July bombings and other terrorist incidents in Britain was launched by MPs today. MI5 and MI6 chiefs, as well as terrorism experts, will be asked to give evidence to the Commons home affairs committee. The inquiry will re-examine what security services knew before 7/7, what should have been done and the Government's response — including the emergency Cobra committee. MPs will assess any “common threads” between 7 July, the failed bombings on 21 July and other terrorist incidents. These include the Crevice case, which saw five men jailed for life for an al Qaeda-linked bomb plot whose targets included a nightclub and shopping centre. Some of the Crevice plotters met two of the 7 July suicide bombers. The inquiry will re-open questions over the report by the intelligence and security committee, which cleared MI5 and the police of blame for 7/7, despite new evidence revealing their knowledge of some of the bombers. Patrick Mercer, a Tory member of the committee, said: "This will be the biggest inquiry in July 7 and terrorist incidents in Britain. "What we are going to try is to look at the links between failed attacks before 7/7 and right the way through to the latest successful and unsuccessful attacks that have been plaguing our security services." Keith Vaz, the Labour chairman of the committee, added: "The Committee will be inviting MI5, MI6 and terrorism experts to give evidence with the aim of gaining a detailed picture of what the security services knew before 7/7, what, if anything, could have been done to prevent the attacks and the Government's response to the attacks." Rachel "North", who coincidentally is "always ending up on things with the nice Patrick Mercer", applied her cross media marketing expertise to the announcement, declaring that "The campaigning is working. Another major breakthrough.". Despite closing that blog post with the words "More soon", nothing has been heard from her since on the subject. So what became of the biggest inquiry into 7/7 that would assess common threads between 7 July, 21 July and other terrorist incidents including the Crevice case? "Unfortunately, these press reports were misleading. The Committee had decided to hold an inquiry into counter-terrorism but had not then decided on its terms of reference. It has subsequently published its terms of reference, which focus on the Home Office's response to terrorist attacks. It does not intend to launch any other inquiries in this area before the end of this Parliament." In other words, Keith Vaz and Patrick Mercer cynically exploited the unveiling of the memorial to victims of July 7th by pretending to launch a far-ranging inquiry into those events, giving the misleading impression that parliament would be investigating them. Patrick Mercer ("a compassionate, thoughtful, principled man" according to Rachel "North") is no stranger to manipulating the media when it comes to "Islamic terror" stories. Bloggerheads has documented Mercer's close links to Glen Jenvey and Vigil, following Jenvey's exposure as a false flag "Islamic extremist" in January 2009. (J7, by the way, picked up on Jenvey and his entrapment affiliates back in November 2006). On Tuesday 1st December 2009, ITV1 presented "Bombers on the Run" in its Real Crime series, describing the case of the incidents on the London transport system on 21st July 2005. The last section of this programme covered the related court case in 2007, but omitted some important details. The prosecution case on the explosives was presented, including the assertion that 70% hydrogen peroxide devices detonated explosively every time in tests. The video footage that was shown in court of one of these test explosions was shown in the programme. The defence testimony of Professor Hans Michels, who stated that the devices used on 21st July 2005 were not capable of exploding, was not mentioned by the ITV programme. This testimony had a significant effect upon the trial because it resulted in the prosecution dropping the charge of conspiracy to cause explosions likely to endanger life. The programme also failed to mention the significant assistance given to the prosecution by the cut throat defence of mysterious defendant "Asiedu" (who claimed he had abandoned the device found in a park in Wormwood Scrubs). His true identity has never been formally established; in a Ghanaian news article two people claiming to be his biological parents state that he is Ishmael "Sumaila" Abubakar and that they had contact with UK security operatives. If so, it is very strange that he was tried under the alias "Asiedu" when the UK authorities knew his true identity. Curiously, at one point "Asiedu" tried to join the British Army. At times during the 21 July trial earlier this year the barrister for Manfo Kwaku Asiedu was landing heavier blows to his co-defendants than the prosecution. It was Asiedu's counsel, Stephen Kamlish QC, who actually made the link between the 21 July plot and the 7 July attacks. That was a line of attack which even the prosecutor, Nigel Sweeney QC, had chosen not to go down. In fact, during legal argument out of the jury's earshot, at least one of the other defence barristers suggested Asiedu and Mr Kamlish be excluded from the trial. Without this "defence", the prosecution may not have been able to secure the convictions for conspiracy to murder against the four principal co-defendants. The jury could not reach a verdict on "Asiedu", but before the re-trial "Asiedu" conveniently pleaded guilty to conspiracy to cause explosions (the charge that had been dropped in the first trial, presumably because the prosecution were no longer confident that the evidence proved guilt beyond reasonable doubt after the testimony of Professor Hans Michels). Coincidentally, the charge against "Asiedu" for conspiracy to murder was dropped. Since plea bargaining is technically illegal, this can only have been a coincidence! The ITV programme omitted the similar assistance given to the prosecution by the alleged confession of defendant Hussain Osman. This occurred after submission of evidence in the trial had concluded, but the judge stopped the closing speeches and allowed the case to be re-opened so that the "confession" could be admitted as evidence. The "confession" was not provided in court by Osman himself, but by two prison officers who claimed to have heard it. The judge did not permit defendant Muktar Ibrahim's lawyer to cross examine this evidence, ruling that it was "irrelevant" to the case against Ibrahim, even though the substance of the confession was that "Ibrahim was the brains behind making the bombs and trying to destroy parts of London" and that "Ibrahim had bullied [Osman] into making the bombs and the distribution of such items"! The ITV programme also showed footage of a liquid boiling in a saucepan, whilst the narrator informed us that the "bombers" boiled the dilute hydrogen peroxide in order to increase its concentration. We can be fairly sure that the boiling liquid shown was not, in fact, hydrogen peroxide since the vapour produced would be liable to detonate spontaneously, just as it would have done in the "bomb factory" if the "bombers" had been boiling it. Tube bombers, Hydrogen Peroxide Reaction? Any one else a bit curious about the composition of the explosive that the tube bombers have been reported to use? I have worked using concentrated Hydrogen Peroxide ,100 vol, to decompose organic materials for analysis. I can not understand how a mix of concentrated Hydrogen Peroxide and flour did not begin reacting as soon as it was mixed. I would have expected such an unstable mix to spontaneously ignite, there would be no chance to transport it any where. Also , how did they concentrate the Peroxide? the reported answer that they boiled down huge quantitys of dilute peroxide on a kitchen stove also seems unbeliveable! In my expierience Hydrogen Peroxide decomposes and loses Oxygen on heating, you end up with water! It is many, many years since I worked with 100 vol Hydrogen Peroxide so prehaps my memory is not as good as it was but every time I read about this story it gives me an uneasy feeling that we are not being told the full truth. Any one like to comment ? , Prof, we could do with your insight and knowledge on this!! Hydrogen peroxide does indeed lose water on heating and decomposes into water and oxygen. Because of this, concentrating the stuff is not easy and requires considerable expertise as well as equipment. The usual method employed in concentrating the stuff commercially is via specialised vacuum distillation, but these people don’t seem to have had the skill or equipment to carry out this method and although I won’t go into details, believe me, it’s not an operation that can be carried out over the kitchen sink. Even laboratory vacuum distillation is hazardous.. Concentrating “concentrated” hydrogen peroxide solutions in a kitchen environment is not viable because if the correct temperature and pressure is reached, the vapour will either detonate or ignite with catastrophic consequences. Other methods of concentration do occur, but again you need the equipment and expertise. No mention of such equipment has been made and only one of the criminals seems to have had anything like a rudimentary general science college education. Either way, it could be said that if these idiots poured the neat hydrogen peroxide as purchased into a saucepan and did nothing else, “concentrated” hydrogen peroxide could be said to be in the saucepan, simply because it’s stronger than the OTC product. The strength of the processed hydrogen peroxide has not been disclosed. With regard to Law Student's point, I can think of a number of explosives with shortened names, some of which are colloquially referred to by the name or acronym of one of the components. However, I very much doubt that the press were referring to the finished mixture in this way when they discussed the peroxide. Why refer to it as such? When you mix sugar and salt, I doubt whether the press would refer to the combination as salt (or sugar). The press do try their best to be reasonably accurate when describing substances to avoid criticism. It’s also incorrect to consider that because peroxide stability increases with molecular weight, the mixture is more stable. It's not always the case. Furthermore, the nature of the fuel also needs to be taken into account. Only then can the stability of the resultant “peroxide” be assessed. Like Mortartube, I'm inclined to think that acetone peroxide or its homologues were involved here. We have yet to be given a credible explanation of how concentrated hydrogen peroxide could be produced in a domestic kitchen, and this is as true for the July 7th and airline plots as it is for the July 21st incidents. J7: The July 7th Truth Campaign (J7TC) have recently published three new articles on our campaign website. 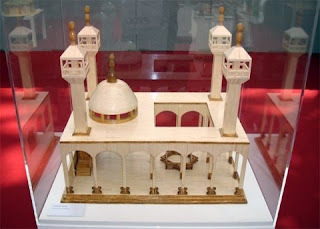 Debunking 7/7 Debunking Parts I and II, written by a J7 forum member and campaign supporter, dissects and debunks some of the spurious reasoning and disingenuous attacks against those not convinced by the official story of 7/7. Read Debunking 7/7 Debunking Part I here and Part II here. Also, Larry O'Hara and Paul Stott, two of the most virulent anti-truth campaign voices, in their publication 'Notes from The Borderland', were sent a response by J7 to 7/7-related articles printed in NFB issues 7 and 8. We have yet to source a copy of NFB9 to assess how this was received but, if the front cover is anything to go by, we anticipate more of the usual ad hominem smears and baseless accusations from the self-professed 'premier parapolitical publication'. Our original article 'J7 vs NFB' can be read here. Over the summer Ian Cobain of the Guardian gave us a series of articles raising serious questions about the collusion of the British government in torture. One of the cases highlighted was that of Rashid Rauf who was arrested in Pakistan in August 2006. The official narrative of Rashid Rauf was that he subsequently escaped from the authorities, a narrative greeted with scepticism by Rauf's lawyer who predicted that a few months after the "escape" there would be a report that Rauf had, conveniently, died. Sure enough, a few months later the authorities claimed that Rauf had been killed in a drone strike. The Guardian accurately described this story as "downright unbelievable". It suggested that it was far more likely that Rauf had died in custody as a result of the torture, and that the unbelievable story had been concocted to cover this up. The Telegraph and Express have come to the government's rescue by assuring us that not only is Rashid Rauf alive and well (and not tortured to death) but, having allegedly masterminded July 7th 2005 and just about every terror plot to have affected Britain in recent years, he is now, according to MI6 no less, as dangerous as Osama bin Laden! Those who have been following the myth of al-Qaeda carefully will recognise the re-cycling of an old story line, that of al-Zarqawi, who was reported killed on several different occasions, and reported alive again on almost as many. Craig Murray has given some insight into how MI6 spends large sums of money to obtain the intelligence that sustains this farcical drivel. (If you prefer a more mainstream source, a recent Sunday Times article describes another MI6 man flying around Afghanistan in a helicopter dispensing thousands of dollars in bundles). Strangely, this waste of money was not targeted in plans for the biggest cuts in public spending for 30 years. The same prospective government is giving a high priority to abolishing our human rights, so perhaps it is not so strange after all. Taken at face value, they do suggest that the speakers intended to take their own lives in acts of violence against others. Savant says "I have sacrificed my life", Khan speaks of "shahada" (martyrdom) and Zaman of "jannah" (paradise, the reward for martyrdom). These videos did not, though, persuade the jury to convict any of these men for conspiracy to murder. More remarkably, this was the second jury which did not believe that the videos constituted sufficient evidence to convict these men. The Daily Telegraph observes that "it indicates that at least three members of each jury chose to believe the men’s defences", namely that they were "simply making a protest 'documentary'". This has direct relevance to the explosions in London on July 7th 2005. Often it has been asserted that the "martyrdom videos" of Mohammad Sidique Khan and Shehzad Tanweer are conclusive evidence that they were responsible for those explosions. The Official Narrative (published before Tanweer's video) cites Khan's video as evidence of his culpability. Yet in neither video do Khan or Tanweer mention sacrificing their lives or martyrdom. In that respect they are less explicit than the videos referred to above which failed to secure convictions. The two juries in the "Airline bomb plot" trials have demonstrated that "martyrdom videos" are not decisive evidence of guilt. They are pieces of evidence to be weighed just as all other pieces of evidence must be in order to reach an overall conclusion. They do not automatically trump conflicting evidence. If the weight of conflicting evidence is greater, then a more innocent interpretation must be put upon the videos. If these "Airline bomb plot" videos with their explicit references to martyrdom are inconclusive, those of Khan and Tanweer cannot be conclusive without corroborating evidence. As part of J7's ongoing research into the events of 7 July 2005 and our work on the campaign for a truly independent public inquiry, held outside of the scope of the Inquiries Act 2005, we have discovered many interesting pieces of related information. One such piece of information is the notable, obscene and undeclared conflict of interests of the chairman of the Review of the Intelligence on Weapons of Mass Destruction, Lord Butler. With the recent announcement of a further Inquiry into the war in Iraq, it is worth reflecting upon this confirmation of the analysis of another Butler that War Is A Racket. The UK has spent £165m on hiring private security companies in Iraq in the past four years - the equivalent to around a quarter of the entire Iraq aid budget, it has emerged. A further £43m has been spent on private guards in Afghanistan since 2004. The security costs, mainly for guards for British staff and facilities, were revealed in a parliamentary answer from the Foreign Office minister Kim Howells. They reflect the huge quantities of money that Britain and the US have had to divert from humanitarian and reconstruction resources to deal with the deteriorating security environment in both countries. In Iraq, a total of £145m has been spent on security guards to protect British assets, with a further £20m going on police training and security advisers to the Iraqi government. Britain's Iraqi aid budget over the same period was £644m. The big beneficiaries have been the New York-based risk consulting company Kroll and the UK companies ArmorGroup and Control Risks. ArmorGroup, which is headed by the Conservative MP Sir Malcolm Rifkind, earned 50% of its £129m revenues from Iraq last year. As part of Kroll, Kroll Security International (KSI) has developed a new security architecture that places your risk management in the context of increasing global insecurity. With an evolving, international capability across a broad spectrum or risks and services, KSI offers a coordinated approach that matches your needs, however they may develop. By working with clients at the outset of the planning phase KSI can provide a holistic strategy, critical in hostile business environments. From a thorough understanding of your risk management needs to creating a dynamic and focused security solution, KSI can take the risk out of your management. Within Kroll’s portfolio of services, KSI has been actively providing protection and security in Iraq for government agencies and companies involved in the reconstruction. Since April 2003 KSI’s knowledge and understanding of the risks involved in operating in Iraq has resulted in invaluable protection to our clients. The security risk throughout Iraq ranges from very high to high across the country. The deterioration in the security situation throughout Iraq over the past six months has been marked. Various factions are seeking to make Iraq ungovernable by the Iraqi government, with a view to disrupting the pending Iraqi elections scheduled for January 2005. Consequently this is impacting on US Presidential elections and precipitating the eventual withdrawal of foreign forces from Iraq. The risk is multi-faceted, being both terrorist and criminal in nature. The terrorist aim is to discourage Iraqis from cooperating with the IIG and MNF, through a series of tactics. These include indiscriminate suicide bombings of Iraqi security forces, the assassination of officials and locals deemed to be assisting the interim government and the taking of western hostages with a view to discouraging foreign governments, humanitarian and commercial organisations from participating in stabilisation and reconstruction efforts in Iraq. Security is the key to success by generating stability and encouraging inward investment. KSI, with its wealth of experience of operating in hostile environments, offers a variety of services to create a secure environment in which clients can operate in relative safety. These services range from advisory and security audits, intelligence audits and summaries, risk and project management, hostage and kidnap resolution, emergency medical and evacuation/repatriation, the provision of highly experienced security details and training amongst others. Kroll’s services are tailored to suit client requirements. MARSH & McLENNAN COMPANIES TO ACQUIRE KROLL INC.
NEW YORK, NEW YORK, May 18, 2004 - Marsh & McLennan Companies, Inc. (MMC) and Kroll Inc. announced today that MMC will acquire Kroll, the world's leading risk mitigation services firm. The transaction will broaden significantly the range of MMC's risk and insurance services businesses and enhance its leadership position in risk management services. MARSH & McLENNAN COMPANIES COMPLETES ACQUISITION OF KROLL INC.
NEW YORK, NEW YORK, July 8, 2004 - Marsh & McLennan Companies, Inc. (MMC) announced today that it has completed its previously announced acquisition of Kroll Inc., the world's leading risk mitigation services firm. Presumably the members of the Advisory Board, including Lord Butler, were consulted about the acquisition of Kroll. Appointed a Non-Executive Director in 1998. He is the Board’s Senior Independent Director. Lord Butler is currently Master of University College, Oxford, a Non-Executive Director of HSBC Holdings plc and is a member of the Advisory Panel to the UK Management Group of Marsh & McLennan. He has recently been appointed to chair the Review of Intelligence on Weapons of Mass Destruction. He is also a trustee of the Globe Trust, a trustee of the Rhodes Trust and Chairman of the Churchill Museum Appeal Committee. Aged 66. THE MAN appointed last week to lead the government's inquiry into intelligence on Iraqi weapons is a paid adviser to an insurance company with multi-million pound contracts throughout the Middle East. Lord Butler of Brockwell, the former cabinet secretary who will have access to some of the most up-to-date intelligence as part of his inquiry, accepts there could be a potential conflict of interest. He does not intend to resign, but said yesterday he and the present cabinet secretary, Sir Andrew Turnbull, would review his business contacts after the inquiry is completed. Butler is a director of ICI and the banking group HSBC, but it is his recent appointment as an adviser to Marsh & McLennan in Britain that could cause most embarrassment. The US-based group is the world's biggest insurance broker and also earns millions of pounds advising companies on international risk and crisis management. Although it has refused to insure businesses in Iraq, it does advise companies hoping to do business there. Butler accepted the adviser's role in December and notified the House of Lords interests register. Last night he referred inquiries about his business interests to the Cabinet Office. A spokesman said: "Lord Butler is not aware of any conflict of interest at this stage. If a conflict of interest did emerge (he) would discuss with the company how this may be resolved." Although this article states that the House of Lords interest register was notified, an examination of that register using archive.org shows that his regular remunerated employment from MMC did not appear in that register until 3rd January 2006, and that the date given for the appointment was 13th December 2005. It appears that the information supplied to the register was neither timely nor truthful. As even his most devout supporters covered their faces in embarrassment at Blair's confession, a new inquiry was set up. And who better to put in charge than Lord Butler? This was, after all, the man who told the Scott arms-to-Iraq inquiry in 1996 that "half the picture can be true". Blair must be hoping that a tiny corner of the picture can be true as well. In the time since his days of loyally serving Blair as cabinet secretary in 1997, he has been acting as a paid advisor to Marsh & McLennan, the insurance brokers. Their other famous employee is Paul Bremer, chief executive of a subsidiary of Marsh & McLennan from October 2001 until he took up his appointment in Baghdad in April 2003. So the man supposedly investigating why Britain went to war on Iraq works for the outfit that provided the person who rules by consequence of that war. So in 2004 Lord Butler was receiving regular renumerated employment from a company (MMC) with a beneficial financial interest (via Kroll) in the Iraq war. At the same time, he was chairing a Review of the Intelligence on Weapons of Mass Destruction. On February 3, 2004, the British Government announced an inquiry into the intelligence relating to Iraq's weapons of mass destruction which played a key part in the Government's decision to invade Iraq (as part of the U.S.-led coalition) in 2003. The committee met in secret and only its conclusions were published on 14 July, 2004. When MMC acquired Kroll between 18th May and 8th July 2004, there was a direct conflict between Lord Butler's private interests as a beneficiary of the Iraq war and his role as a public servant reviewing the intelligence relating to that war. Lord Butler never declared this conflict of interest, nor did the government replace him on the review committee because of it, nor did anyone in the media bring this to the attention of the public. J7 acknowledges the lead given to it by the Kelly Investigation Group for this story. For more information about Kroll, please see Truth and Justice for Richard Chang. "Is the Kennedy assassination conspiracy just a lot of hoopla kicked up by "conspiracy buffs"? Most of the independent investigators I have met seem to be serious politically literate people. Their struggle to arrive at the truth is not impelled by a love of conspiracies but by a concern for the political and historic importance of the case. They seek the truth no matter how dirty it might be. That process of confronting the machinations of the national security state is not a conspiracy hobby. It is an essential part of the struggle for democracy." At 9pm on Tuesday 30th June, we will have the opportunity to watch the BBC's 7/7 Conspiracy Files episode which was delayed due to the retrial of the 3 accused of helping to plan the events in London on 7th July 2005. Despite two trials, which showed for the first time unreleased CCTV and other evidence of these events, the jury found the three accused, Ali, Shakil and Saleem, not guilty of the charges. 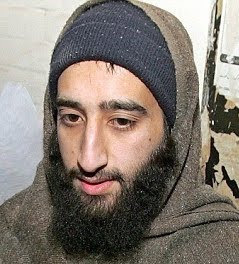 Some argued that if the four accused of bombing London were in fact innocent, then their three close friends, Ali Shakil & Saleem, would have challenged the evidence shown and protested that the Official Conspiracy Theory (which, to date, and without any conclusive proof, is all the State's version remains), was false. This is a flawed argument, because if the three knew nothing about the plot, they could hardly argue in their defence that it didn't happen the way we have been told. Yet, while anything other than the official 'narrative' of events is derided as a 'conspiracy theory', it was nothing less than a 'conspiracy theory' which formed the basis of the prosecution's case. "In his closing speech to the jury, Henry Blaxland QC, defending Ali, likened the prosecution allegations to the fairy story of the Emperor's New Clothes. 'In the parable, the people are afraid to undermine the status quo by questioning the Emperor,' he said. 'The status of these allegations - the killing of 52 people - put before you with the full weight of the Crown Prosecution Service behind it is such that some of you might have some reticence in saying the simple and obvious thing - that it can be proved beyond reasonable doubt is ludicrous. 'The prosecution case is entirely devoid of anything that could be described as reliable evidence and is an exercise in speculation - the prosecution could not decide which way to jump. He went on to describe the 'fundamental implausibility' of the theory that Ali, Saleem and Shakil travelled to London seven months before the devastating attacks to scout out possible targets. He said: 'The prosecution say that the picture that emerges from the phone data is so compelling, but it is strangely quite the contrary. 'The records are positively inconsistent with this. 'Only a hardened conspiracy theorist with an inflexible mindset could squeeze a sinister interpretation out of the phone records. J7 is somewhat dubious as to the ability of the BBC to do justice to the considerable body of evidence which questions the Official Conspiracy Theory (as outlined with little actual evidence in the twice amended official report of the London bombings produced by the Home Office in May 2006) preferring instead to set-up straw men which are easily knocked down. With the participation of Nick Kollerstrom they will also be able to add 'holocaust denial' to the list of reasons why 'conspiracy theorists are dangerous and must be avoided at all costs'. J7's honest, principled and reasoned refusal to participate in this sham of a 'documentary' -- if previous outings of the Conspiracy Files are anything to go -- can be read here. Will the BBC's Mike Rudin and Tristan Quinn examine the nature of the explosives? Or how Germaine Lindsay, on the 'packed to capacity' Piccadilly Line train, was able to scatter both his ID around the carriage and place a large backpack on the floor of the train before detonating the explosives? The bombers scattered identity and bank cards around the Tube carriages they targeted before placing their rucksacks on the floor and setting off the explosives inside them, jurors heard. Or, why the Metropolitan Police claimed that 3 trains were involved in the Edgware Road incident and that a 'hole was blown through a tunnel wall'? Or, how 'Supergrass' Mohammed Junaid Babar, after undoubtedly coming to the attention of the world's Security Services, was still able to freely travel between the UK and Pakistan to apparently meet with Khan, Khawaja and Khyam. Or, examine the role played by ex-SBS anti-terrorist operative, Martin 'Abdullah' McDaid in running the Iqra bookshop in Beeston Leeds. Or, re-interview Richard Jones, an individual given considerable air-time by the BBC, who has given many and varied versions of what he claims to have seen aboard the number 30 bus which means that, at best, he is an extremely unreliable witness. Furthermore, none of his accounts bear any relation to Hasib Hussain. Or, why no CCTV has been released that shows any of the 4 accused approaching the underground platforms, on the underground platforms or boarding the trains or the number 91 or 30 bus. One of the released CCTV images of the 4 together leaving KX Thameslink Station (noticeably not the 'iconic' hugging that the Official Conspiracy Theory claims occurred). Or, why Hasib Hussain would have known his detonator was malfunctioning if he hadn't already boarded a train and attempted to detonate his explosive, thus necessitating a return to King's Cross to purchase a battery. Or, how young David Foulkes tragically died on a train that had left Edgware Road station, when he should have left the train at Edgware Road station after having arranged to meet a colleague there and, according to his father, travelling the three stops from Euston station. Or, why Scotland Yard denied the fact of a second controlled explosion on the Number 30 bus. Or, why none of the drivers of the 3 trains that were involved that day have been interviewed, named or honoured. On the contrary, the driver of the Piccadilly Line train, Tom Nairn, was refused compensation on the grounds that the 'police had no record of him'. ... I also think it is important to investigate the conspiracy theories that continue to develop around 7 July attacks, because they play on the fears of the Muslim community and spread a highly divisive and damaging message. We would argue that it is the constant demonisation of the Muslim community, the endless arrests and prosecutions, some for no more than possession of a CD, and the abundance of hideous anti-Muslim propaganda that hinges on the official conspiracy theory about how 7th July 2005 came to be, that really spread 'a highly divisive and damaging message'. Whatever negative picture the BBC set out to paint of those who question the government about the events of 7/7 -- something we do in precisely the same way that campaigners and activists who challenge the government over the reasoning and justifications for the illegal invasion and occupation of Iraq, ID cards, MP expenses, or indeed any other issue that impacts upon the entire population -- J7 will remain exactly what we say we are, a Truth Campaign. We have campaigned for the truth about the events of 7th July 2005 for nearly four years, and we will continue to do so until such time as the truth is known. Unless there is evidence in the public domain that proves conclusively the Official Conspiracy Theory, then it remains a conspiracy theory, as outlandish as any other, and we will continue to (in keeping with Henry Blaxland's defence) "question the emperor" even if it does "undermine the status quo". We leave the last words to Omar Khyam, Anthony Garcia, Waheed Mahmood, Jawad Akbar, and Salahuddin Amin, as spoken by lawyer Imran Khan outside the Old Bailey at the end of the Operation Crevice trial. On 28 April 2009 Wahid Ali, Mohammed Shakil and Sadeer Saleem were found not guilty of conspiracy to cause explosions at their second trial at Kingston Crown Court. They had been accused of carrying out a hostile reconnaissance of London tourist sites on 16/17 December 2004. BBC2's Newsnight carried a report of the acquittal. Richard Watson claimed that the main charge of the 7/7 bombs was a mixture of concentrated hydrogen peroxide and powdered masala spice. At both the first and the second trial Clifford Todd of the Forensic Explosives Laboratory at Fort Halsted in Kent had testified that the bombs were made with ground black pepper. However, according to his testimony on 2 May 2008, no pepper residue was detected at any of the four bomb sites. For about a week after 7 July 2005, media reports, now hard to find, mentioned the military explosives RDX and its plasticised version, C4. With the discovery of an alleged bomb factory at 18, Alexandra Grove in Burley, Leeds and IEDs at Luton Station carpark, the talk turned to TATP, triacetone triperoxide, or HMTD, hexamethylene triperoxide diamine. Official sources were guarded. The Home Office narrative spoke only of home-made explosives while the ISC went only so far as to specify organic peroxides. For more detail, see The Changing Type of Explosives Used. At the 21/7 trial chapatti flour and pepper were introduced. The bombs that failed to explode in London on 21 July 2005 were almost identical to the ones that killed 52 people on the transport network two weeks earlier. But why didn't they go off? Investigators spent many hours examining the devices used on 21 July and comparing them with the 7 July bombs. There was only one minor difference - the 7/7 bombers mixed ground pepper into the mixture while the gang two weeks later used chapatti flour. But Dr Stuart Black, an explosives expert who gave evidence at the trial, said that was not the reason the devices failed to explode. Two theories were offered at the trial at Woolwich Crown Court. The plot's prime mover, Muktar Ibrahim, himself suggested the device would not explode because he had deliberately diluted it with tap water. But the prosecution offered another view. Hydrogen peroxide is well known among experts as a potential bomb ingredient- but only if used in the correct concentration. The 21/7 bomb makers failed to achieve the required concentration whereas the 7/7 chemists apparently did. Given that pepper was mentioned at three trials, it is surprising that Richard Watson neglected to mention that fact when he claimed that the main charge was masala. Web searches have failed to turn up any reference to masala in connection with 7/7. 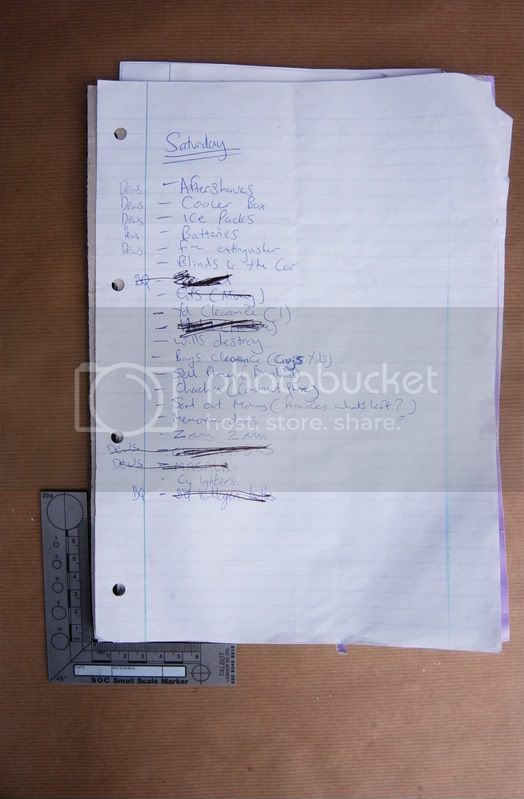 However, the doyenne of J7 researchers found that during the first '7/7 helpers' trial two '7/7 shopping lists', found at 18 Alexandra Grove, had been presented in evidence and released by the Metropolitan Police Service. There are three occurrences of masala here: masala/citric, masala + citric and masala (15kg). Citric acid is used as a catalyst in the preparation of HMTD. There is one mention here: Dews MASALA (Dews = Dewsbury). 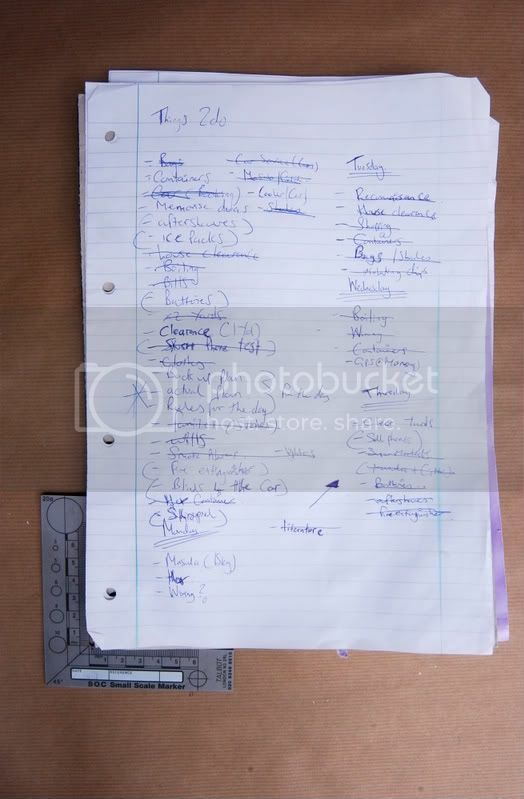 Pepper does not appear in these lists and yet was found in the Burley flat. Kingston Crown Court heard explosive materials were found scattered in "disarray" across various rooms at 18 Alexandra Grove, Beeston, which the jury heard was the "principle" site for the construction of the bombs detonated on the London transport network. The jury, who were shown pictures from inside the flat, heard containers of a mixture of black pepper and hydrogen peroxide, used as the main charge for the bombs, were found sitting in the bath and traces of high explosive HMTD were on the cooker in the kitchen. They also heard that the floor of the lounge in the flat was covered with bags of clothing and other items including heavy-duty gloves, masking tape, a rucksack and containers full of a "brown sludge", which was the pepper and chemical mix. 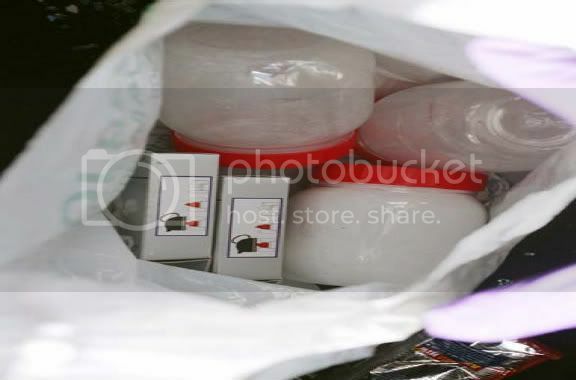 Empty bags of ground black pepper were found along with ice-cube bags and ice packs in the kitchen, which the court was told were used to keep the devices cool. And plastic trays containing bicarbonate of soda and citric acid were also discovered. This seems to match up with the explosives found in the Nissan Micra at Luton station car park. 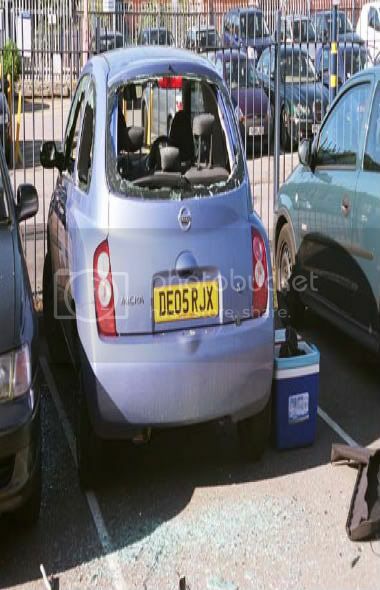 Four intact nail bombs were discovered in a Nissan Micra left at Luton airport [sic], Kingston Crown Court heard, along with four containers of bomb-mixture and four detonators. However, the images released by ABC News, accompanying this story on 27 July 2005 show only white explosives. There were no brown sludge bombs at Luton. There were no white mixtures at Alexandra Grove. The Counter Terrorism Command of the Metropolitan Police Service has searched several other suspected bomb factories. Traces of explosive were reportedly found at Mohammad Sidique Khan's Dewsbury house and at 111 Chapeltown Road, Leeds. The sum of £100 million spent on Operation Theseus has failed to establish the nature of the explosives used on 7 July 2005. The main body pushing for 7/7 ‘truth’ is the July 7 Truth Campaign which runs the website http://www.julyseventh.co.uk/. Given its lineage, it is no surprise that 7/7 truth has been dogged by many of the problems that have effected (sic) the 9/11 ‘truth’ movement. The presence in London on the day of 7/7 of both Israeli politician Benjamin Netanayu and former New York Mayor Rudi Giuliani, plus the perceived involvement of an “Israeli company” in running security on the London Underground, was a heady brew, leading to all manner of crank theories, although depth is another matter. Stott fails to enlighten us as to what he understands the 'lineage' of the July 7th Truth Campaign to be. Despite this, it is clear from his paper that what he describes as 'being dogged by many of the problems that have effected (sic) the 9/11 'truth' movement', translates as, 'any mention of Israel or Mossad will be viewed as anti-Semitism'. He also fails to back up his accusation regarding 'all manner of crank theories'. For the record, The July 7th Truth Campaign choose not to speculate on alternative theories, preferring to focus on the few verifiable facts that exist, while maintaining pressure on the State to present evidence which conclusively proves the 'official conspiracy theory' as outlined in the Home Office narrative. Stott's paper, rather than offer any sort of insightful analysis, has instead exposed his own methodology, a methodology which involves smears, insinuations and unfounded accusations rather than an honest examination and analysis of the facts. There is only one reason that Israel and Mossad are examined by J7 in connection to the facts of the events in London on 7th July 2005 and that is: we cannot avoid examining these areas if we are to conduct a comprehensive, factual and forensic analysis of these events. The company concerned, Verint Systems Inc, was appointed in 2004 by Metronet to provide CCTV on parts of the Underground. They are an American company, with headquarters in New York. Truthers suggest it is a subsidiary of Israel's Comverse Technology, and therefore infer Israeli involvement in the attacks. Why does Stott choose to claim Verint have no links to Israel? 'Congress insists the equipment it installs is secure. But the complaint about this system is that the wiretap computer programs made by Comverse have, in effect, a back door through which wiretaps themselves can be intercepted by unauthorized parties. The investigative approach of Stott would seem to dictate that everyone ignore Verint's role in the operation of security systems on the London Underground, purely on the basis that to examine this aspect would be in some way 'anti-Semitic'. Quite clearly, and by their own admission, Verint are indeed linked to the Israeli firm with questionable business practices, Comverse, and Verint were indeed awarded a 'security' contract for the London Underground. Despite the as plain as day evidence existing to sound alarm bells about both the business and financial practices of Comverse, the company of which Verint is a wholly owned subsidiary, this can -- by the same logic Stott presented to the Anarchist Studies Network conference -- be entirely ignored. Verint is by no means the only private company involved in the operation of the London transport system and other such companies are duly highlighted by J7 and afforded similar examination. We also highlight the fact that Transport for London was in the charge of no lesser mortal than the ex-Deputy Assistant to the Director of the CIA, Robert Kiley. Further detail about the private organisations involved in the running of essential public transport services are included in the Private Companies involved in London Transport section of the J7 web site. It is deeply ironic that, as well as challenging the State in its various guises, challenging the dominance and stranglehold of private organisations on public life was once a core political activity among left-wing and anarchist groupuscules. As was examining the actions and nature of the racist and apartheid State of Israel once possible without the unfounded smear of anti-Semitism. Another 'fact' that cannot be ignored by J7, or anyone else researching the events of 7th July 2005, is what Stott refers to as the 'presence in London on the day of 7/7 of .. Benjamin Netanyu' (sic). Far from Netanyahu's mere presence in London being of concern, the reason Netanyahu features in our analysis at all is as a direct consequence of it being claimed that he received a warning prior to the attacks. The facts are that Netanyahu was due to attend the Tel-Aviv Stock Exchange / Deutsche Bank Conference in the Great Eastern Hotel in Liverpool Street station (the site of the first explosion) but a prior warning (later denied by Scotland Yard) meant he remained in his hotel in Russell Square, close to the sites of two further explosions. "The Israeli Embassy were quick to deny that this conference could have been the target for such an attack. Israeli officials stress the advanced Scotland Yard warning does not in any way indicate Israel was the target in the series of apparent terror attacks." Was the Israeli Embassy issued a warning prior to the attacks? If so, who issued the warning? How did the Israeli Embassy know that this conference was not the target for such an attack? If the Israeli Embassy did not receive prior warning, how did the story about notification come to be, where did the idea that Israel was the target originate, and which “Israeli official” denied this to be the case? If anyone were to take Stott's article seriously, possible foreknowledge and forewarnings about 7/7 which had the potential to save the lives of innocent commuters should be ignored and nobody should be asking or demanding answers to questions such as those listed above. The multiple, simultaneous explosions that took place today on the London transportation system were the work of perpetrators who had an operational capacity of considerable scope. At 08.51 on 7 July at Liverpool Street Station there was an explosion in a train carriage 100 yards into the (Liverpool Street-bound station) tunnel. 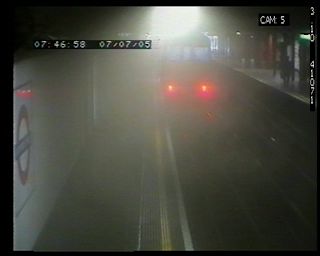 At 08.56 there was another incident at King's Cross / Russell Square. Both stations were used to bring out casualties. At 09.17 there was an explosion on a train coming into Edgware Road underground station approximately 100 yards into the tunnel. This explosion blew through a wall onto another train on an adjoining platform. Three trains are believed to have been involved. At 09.47 there was an explosion on a bus at Upper Woburn Square junction with Tavistock Place. It wasn't until a press conference held two days later, on 9th July 2005, that Tim O'Toole claimed the underground explosions happened "almost simultaneously", within 50 seconds of each other at approx. 8.50am. Oddly, recently released CCTV from Liverpool Street purporting to show the explosion is time-stamped 07.46.58, over an hour before the alleged and revised timings of the explosions. "apparently-ordinary British citizens, young men conservatively and cleanly dressed and probably with some higher education. Highly computer literate, they will have used the internet to research explosives, chemicals and electronics," "They are also willing to kill without mercy - and to take a long time in their planning. They are painstaking, cautious, clever and very sophisticated." Furthermore, to ignore the history of what are now well-documented false-flag operations, and to ignore Mossad's previous roles in 'false-flag' operations in the UK would be little short of foolish. In 1988, 28 year old Ismael Sowan, a research assistant at Humberside College of Higher Education, was discovered by British police to be in possession of a large quantity of arms and explosives. Sowan was working for Mossad, the Israeli intelligence agency. Mossad's plan was that Sowan would let off bombs in Britain that would leave sufficient forensic clues to suggest that they were the work of Moslem countries and thus damage Anglo-Arab relations. Sowan had been run by a five man Mossad team operating in Britain under the cover of a private company with the tacit approval of the Foreign Office and MI5. After the discoveries by the police the Foreign Office felt it had to ask the Mossad team to leave the country. It would appear to be of no concern to Stott that Halevi and Stevens seem to have been several steps ahead of both the police investigation and the unfolding official narrative. J7, however, feel that such items warrant far greater investigation than Stott's instant dismissal. "... terrorists were too often released in the past by governments because they were afraid of them, comparing it to the mistakes made in the 1930s over Hitler. "I think their determined response to it, against public opinion very often, has helped keep us safe and I think if they had been more typical of some of our politicians, they would have shifted because of public opinion which would have been disastrous." He added: "I have great respect for their setting a very determined policy as regard to terrorism, sticking with it when it became unpopular and I credit the fact we have been able to reduce terrorism to what they have done." Abdallah al-Thani remains a named defendant in the 9/11 lawsuits that are still proceeding in Manhattan federal court, but his Washington lawyers declined to address the charges that he shielded KSM, insisting only that he never "supported" any "terrorist acts." Asked if Abdallah al-Thani ever supported any terrorists rather than their acts, his lawyer David Nachman declined to comment further. 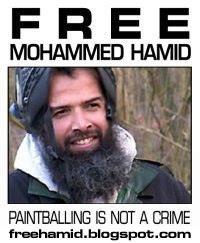 The Congressional Research Service report summarized the evidence against him: "According to the 9/11 Commission Report and former U.S. government officials, royal family member and current Qatari Interior Minister, Sheikh Abdullah (Abdallah) bin Khalid Al Thani, provided safe harbor and assistance to Al Qaeda leaders during the 1990s," including KSM. Peter Boyer, whose New Yorker profile of Giuliani appeared this August, quoted D'Amuro and Giuliani about the expertise and work of Ali Soufan, an Arabic-speaking Lebanese-American who also left the FBI to become the international director of Giuliani Security. Both D'Amuro and Giuliani said that Soufan, the lead investigator in the bombing of the U.S.S. Cole in 2000, had been spending "most of his time" in a Persian Gulf country that is a Giuliani client. Boyer didn't identify the country, but another source familiar with Soufan's assignment has confirmed that Soufan has, until recently, been based in Qatar. "The firm has helped the country with training, and with a revamping of its security infrastructure," Boyer wrote. "The locale is an ideal listening post for someone whose expertise is unraveling the tangle of international terror." Sabir's defense lawyer has cried entrapment. The accused himself later testified he had no idea that the Sheik Osama he was heard pledging his loyalty to was the Qaeda terror chief named bin Laden. But the musician, an accomplished jazz bassist named Tarik Shah who once played with the Duke Ellington Orchestra, has already pleaded guilty to a terror-related charge. So have two other men in the case, a Washington, D.C., cabdriver and a Brooklyn bookstore owner. The FBI counts the case as one more victory in what it considers to be its top-priority mission: finding would-be terrorists before they can carry out their plans. This trial has been heard twice and on both occasions the jury have failed to convict. The U.S. administration is now attempting a third re-trial and will presumably continue retrying until such time as it receives the politically expedient verdict it desires. If at first you don't succeed, trial, trial again. While the likes of Stott and O'Hara, along with their Notes from the Borderland and 9/11 CultWatch efforts, will happily devote their time to hunting down alleged 'cultists', real players wielding real powers using real deceptions and with real contacts to the real powers that be, are able to manoeuvre, often-times in full public view, safe in the knowledge that they will continue to be ignored by those who profess to offer radical views and radical politics. After all, States don't use terrorism, assassination, mass murder and war against innocent civilians often in the name of National Security and protecting their National interests do they? To believe they do might earn you the label 'Conspiracy Theorist'. Additionally, why would anyone chance being accused of anti-Semitism by pointing out that amongst the main beneficiaries of the events in London on 7th July 2005 have been the burgeoning police state in the UK, the profitable and ever expanding 'security businesses' and the illegal, racist and apartheid state of Israel. The Ummah pejoratively referred to by Stott in his presentation, however, has not benefited in any way from these attacks. Whether or not the left, radical or otherwise, and anarchists alike choose at some stage to recognise that they have been reduced to parroting variants of the official State-sanctioned doctrine of the US/UK alliance 'War of Terror' remains to be seen. If Stott's paper, Half Truth Movement: How The 9/11 Cult Falsifies History, is in any way indicative of the positions held by Notes from the Borderland, Class War, the left, anarchists, or any other group, then the outlook is very bleak indeed. Whilst J7 have no links to any 9/11 truth movement, we do believe that these seminal events require open-minded research and analysis. We are also aware that some spokespeople and proponents for 7/7 and 9/11 truth hold some esoteric, offensive and frankly bizarre views on the way the world works. We would argue that this is the very reason why events such as 9/11 and 7/7 must be understood in their correct historic and political context, something that the so-called left have so far failed to incorporate into their political analyses beyond the official narrative of events. Cui Bono? Who benefits? Who is really in favour of 'half-truths'? Who watches the CultWatchers? 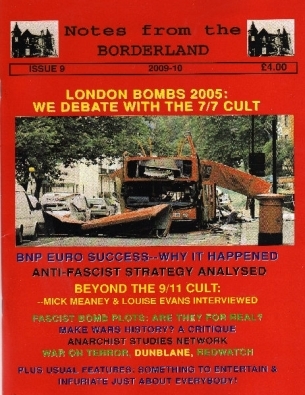 From this brief critique of Stott's paper the evidence would seem to favour the notion that it is certain self-styled 'cult-watchers' and the authors of Britain's self-styled “premier parapolitical investigative magazine” who, with particular reference to the events of 7/7 and the means and methods of the July 7th Truth Campaign, are the principle proponents of half-truths.